Steve and Eileen Maynard, behind Tess Szamatulski, at Maltose Express in Monroe, Conn. The couple with the bag of beer bottles beamed as they bounced into the hombrew store. 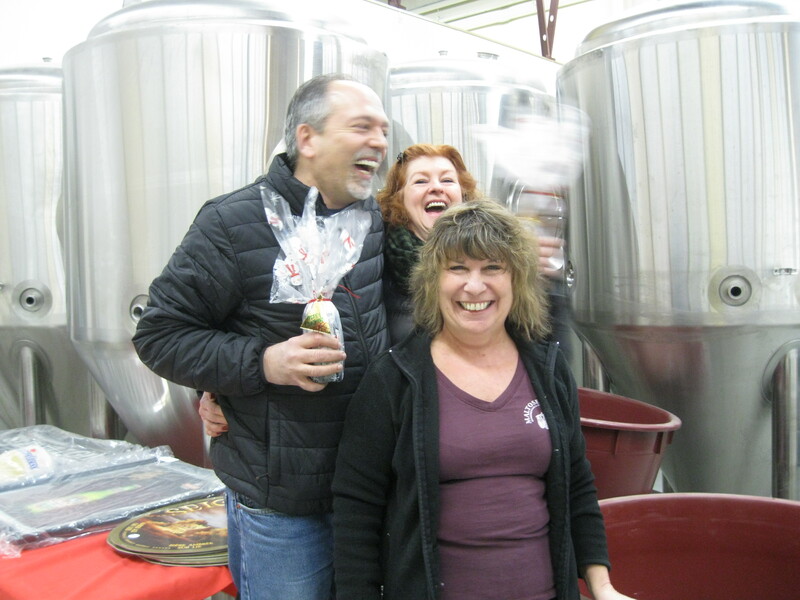 Steve and Eileen Maynard were just beginning their annual tour, visiting friends to distribute their Christmas beer. They let me tag along as they handed out whimsically wrapped bottles, which they called their Jolly Good Christmas Ale. From sitting in on the brewing to witnessing the deliveries, I had a chance to see what real appreciation looks like. They’ve just entered Maltose Express in Monroe, where the employees have walked Steve through crises small and big since he started brewing almost 10 years ago. Steve’s hobby began with an extract kit that he lobbied for as a Father’s Day gift. In five years he graduated from turning pre-fabricated syrup into beer on his stovetop to brewing with raw ingredients on a small, open-flame set-up on his deck that overlooks a wooded backyard in Cheshire. It was there in August that I had a chance to watch as Steve, Eileen and Eileen’s brother Peter poured the nascent beer into its fermentation bottle in hopes that months later it would serve as a small thank you for a year of inspiration and guidance. 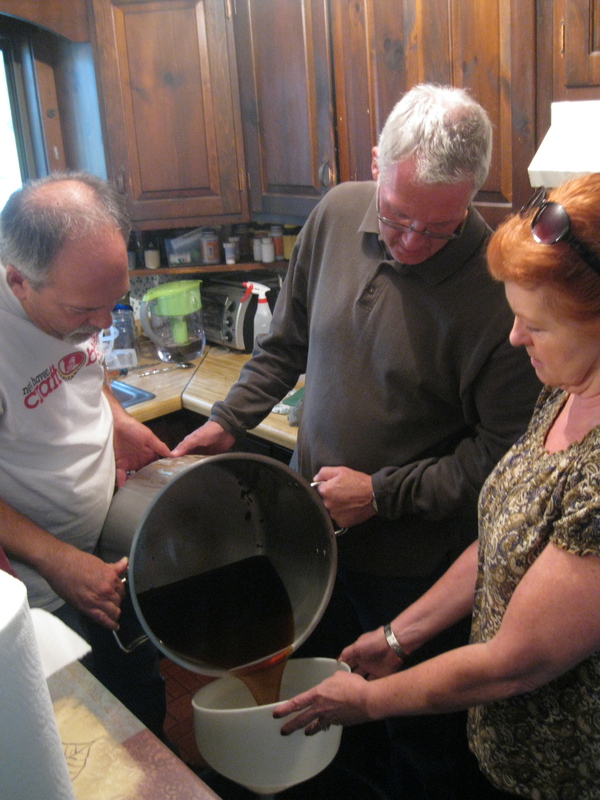 Steve Maynard, left, with Pete Eagan and Eileen Maynard, making Jolly Good Christmas Ale. Steve is bearded and balding and has a crooked smile so endearing you just have to join him; he’s joined at Maltose by his raven-haired wife with pale skin and piercing eyes. As they hugged Maltose’s husband and- wife co-owners, Tess and Mark Szamatulski, they all talked about specifics: what kind of malts were used, how many hops added at what stage of the process? Pretty soon the tasting cups were passed around and were enjoying the boozy punch that came with sips of the English dark ale. It incorporates a combination of malts dark malts, including chocolate malt, and two hop additions: U.K. Bramling Cross for flavor and Northern Brewer for bittering. To give it some Christmas spirit, Steve used Ceylon cinnamon sticks from Sri Lanka in the boil and organic raisins soaked in Guatemalan rum. Maltose customers occasionally drop off their homebrewed beer as tokens of appreciation, Tess said, but noted that Steve’s beers are particularly adventurous. Within a few months, she’ll be able to serve up pints of her own beers as she and her husband open up their own brewery – Veracious Brewing — right next to Maltose. Steve and Eileen continued their tour at New England Brewing Company, where a line of about 30 people snaked around the tasting room. Steve zeroed in on his target – tasting room manager Craig Gilbert. There was a temporary tremor of ill will when the patient line-waiters saw the couple stride straight to the counter, but that quickly dissipated when they saw Gilbert’s gleeful reception of the beers, to be shared with other members of the New England Brewing gang. 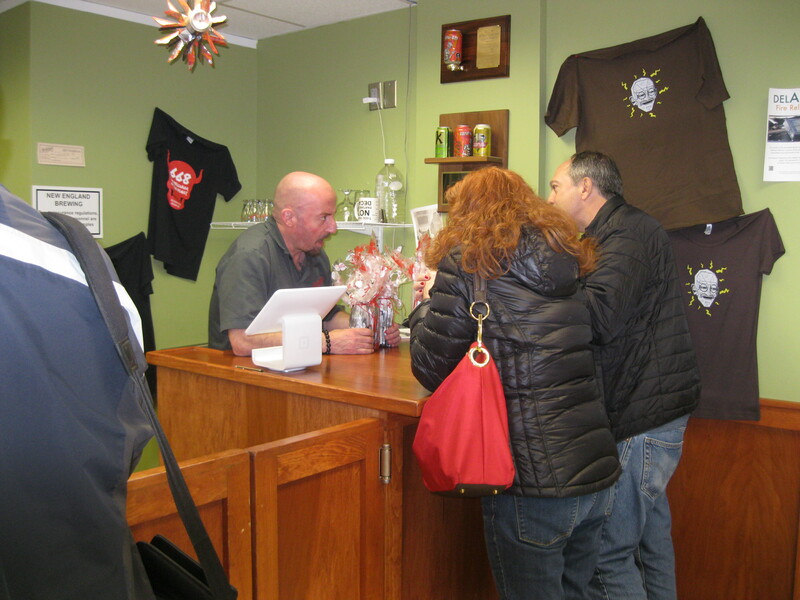 Craig Gilbert, left, of New England Brewing is pleasantly surprised by a gift drop-off by Steve and Eileen Maynard. In all there were 98 bottles to distribute, and after passing along some to Ryan Whipple – a co-owner of the Corner Tavern in Naugatuck – Steve and Eileen settled in for some lunch and winter warmers, which are higher-alcohol beers often with hints of spice. We talked about how Steve, a Shelton factory manager who works primarily with automotive equipment, got so hooked on “Christmas ale” brewing and sharing. After a few years of extract brewing, his first all-grain beer was a 2010 English strong ale. He’s since created a Belgian spiced beer and a stout with allspice. His appreciation for Belgian brewing inspired Steve to call his home brewery “Brasserie Menard,” a Frenchified version Maynard Brewery. The three of us chatted about the upcoming deliveries they’d be making: to Relic Brewing in Plainville and Firefly Hollow Brewing in Bristol to name two. The trips were giant thank yous for a year of inspiration. As I savored my pint of Father Christmas Highland Ale from East Hartford’s Olde Burnside Brewing, I got to thinking that there must be creative ways for me to do the same thing, but instead you get this column. Thank you, servers, brewers, keg-washers, Tweeters, bloggers, bar backs, and readers. This column was originally published in the Waterbury (Conn.) Republican-American on Dec. 31, 2014. This entry was posted in Beer Snob and tagged Corner Tavern, Firefly Hollow Brewing, Maltose Express, Maynard, New England Brewing, Relic Brewing, Veracious Brewing. Bookmark the permalink. ← Does it matter where a beer is made?